Daryl Powell reckons the way his Castleford Tigers players handled the pressure of playing a Leeds Rhinos team gunning for them can stand them in good stead at the business end of the season. 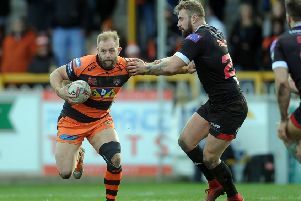 After the cup defeat at Hull it was thrown at Cas that they could not handle the big games, but the 23-12 win in a white hot atmosphere at Headingley disproved that theory. Cas boss Powell said: “I just thought our management of the game in tough conditions was good, our skill level was good and defensively we were great. We found a way to win a game in a slightly different way. “I mentioned the way we played against Salford earlier in the season in similar conditions. I thought we learned some valuable lessons from that and we applied them on Friday against a Leeds team that was desperate to beat us. “It was a big win for us and I think we got rid of a few doubts about us as a team, which I’m really pleased with. “We scored some smart tries, but not our usual ones and, again, that shows it’s a team that’s got a fair bit going for it. The victory came despite the Tigers gifting two tries to the Rhinos. Powell said: “Obviously we gave a couple of bits and pieces away to Leeds, which was disappointing in slippy conditions. “Benny’s was a poor decision. I’ve seen what he was trying to do, but probably he wouldn’t want to do that again. And then the other try was Paul McShane working harder than probably he needed to. He just needed to let Jy Hitchcox do his job. “It was disappointing, but you are going to get bits like that when you concede tries that you think you shouldn’t. “I just thought we handled it well. Being under pressure at different times. “I thought we were a bit unlucky not to score another try with the kick. It was a bit frustrating that one and we’ve given Fozzy (Alex Foster, who was given offside) a kick up the backside this week!